I listen to the radio. And I listen to the commercials. Especially the commercials on one of our 8 radio stations. The radio commercials we write, engage and keep people listening longer. If I ever need to remind myself of what most local radio ads sound like…I just pop it over to a station outside of our group. It’s kinda painful. I like to evaluate the ads on any station – ours or theirs. I can tell the difference between an ad that has potential…and an ad that will help listeners tune out faster. I heard an ad recently that needed some major help. 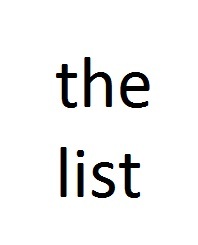 It contained “THE LIST”. The ad that lists about 15 different products. One after the other…and anoothther…and anothththeerrrr…Zzzzzzzzzzzzz. So, what were they trying to do? They wanted to let everybody know that they have a huge selection to choose from. I get it. But the problem is…it’s grounds for being a SNOOZER AD. There are many different kinds of snoozer ads, but today we’ll talk about “the list”. How can we let people know that you’ve got a lot of great products? Well, you can let them know you’ve got ONE great product, and a lot of others just as great. What I mean is, you focus on ONE product. You dazzle people with its greatness. You make them SEE themselves using the product. You make them see how wonderful it would be if they OWNED it. You describe the product through story. You describe the process in making the product. Whatever awesome things your product can do for your potential new customer or whatever they might find interesting about the product, you talk about it. Maybe it’s super high-tech. Maybe it’s a combination of this and that. Maybe it has a feature that people don’t know about. But you can’t be tempted to start rambling off a bunch of other products. When you start listing products one after another, that’s when your Snoozer Ad Warning System signals “red alert” in your brain. Don’t do it. Be strong. Once you’ve pulled out some great juicy bits about your ONE product, then you can say something like, “If you don’t think it’s the best thing since sliced bread, why not inspect one of our other 27 selections.” Or something like that if you really feel the need to let people know you have a ton of products. When you intrigue people with one product…and they believe that it’s truly a whiz-bang product…they’re going to assume all your other products (or services) are equally as fantastic. And by doing your radio ad that way, instead of inserting “the list”, your ad became interesting, entertaining, informational, and above all…a non-snoozer. Have a great day! Do one thing better than anyone else could do today. I’m a hard-working guy at Results Radio Cumulus Media in Sioux Falls. If you want to chat, drop me a line!